Pepperbox Ranch is Western Hospitality at its Best. Come and share the fast vanishing atmosphere of the old west! Our delicious home-made meals are served family style so that everyone can share the events of the day. 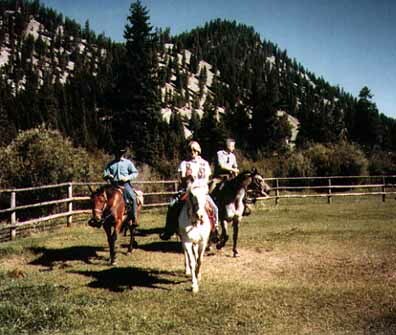 Pepperbox Ranch is nestled in the lush green forests of Montana's Bitterroot Montains. The cold clear waters of the river run right through the ranch. There are very few places left where the mountain scenery is as spectacular, the wildlife as abundant or the outdoor adventure as enticing! We have a full selection of activities to choose from: fishing, gold panning, horseback riding, archery, buggy rides, hiking, cross country skiing, sleigh rides and so much more. But, you may want to just relax by the river or curl up by the fire with a good book. Cozy log cabins are rich in early American charm, each has a fireplace or a wood buring stove, private bath, spacious porch, hand-made quilts and a cookie jar filled with homemade cookies. Pepperbox Ranch is a working ranch raising and training a small herd of Texas Longhorn Cattle and Paint Horses. Frequently our guests ride the range helping to check the cattle. Stanley-Sawtooth Cowboy Poetry and Music Gathering Stanley ID September6-7 Enjoy the Stanley-Sawtooth Cowboy Poetry and Music Gathering featuring ten seasoned performers and a Youth Poetry Contest for up and coming buckaroos and buckar-etts.